This is what they looked like when I got to work. I had the sad duty of coming to terms with the fact that, although I was almost done with Chart 3 (of 4) on the leg, the sock was too big. Just too long. And if I kept going, I might not have enough yarn for sock #2. So I spent my bus ride imitating a froggie. My socks for this month might have to be some quickies for the girls instead of these bad boys. 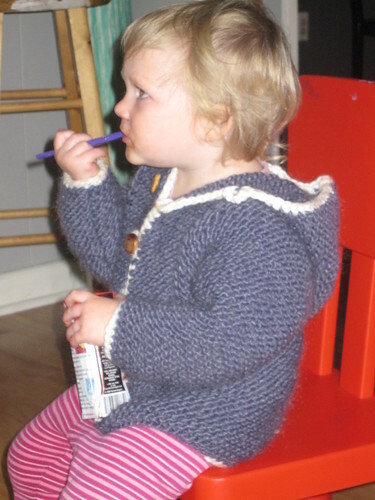 Speaking of the girls, I did manage to get some modeled shots of Boo in her Tomten. I think she likes it, because she wouldn't take it off until bath time, resulting in a lovely ketchup splotch across the front from dinner. She wore it again this morning, so I think this one is a keeper! 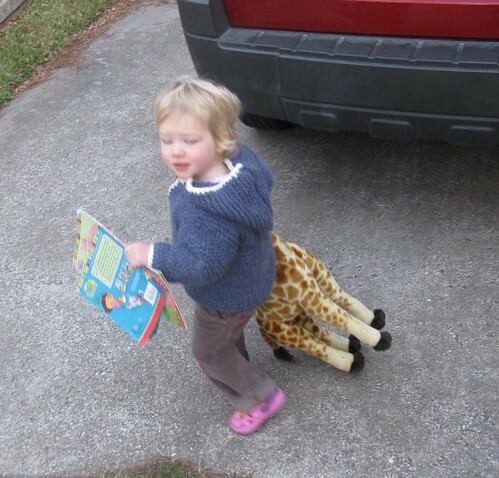 Please note the pink Dora Crocs, three Dora books clutched in one hand, and 'Raf under the other arm. She is prepared for the day. Written by porpoise On January 21, 2009 In "Boo", "Tomten", "frog pond", "socks"